Cocobolo Rosewood is in a league of its own. It smells of cinnamon when carved and changes colors as it ages, with each passing day adding depth and complexity of appearance. Mature Cocobolo radiates with oily orange and deep red, streaked by either black or white grain and sap. This is the one pen that will evolve with you, transforming from simply stunning to utterly breathtaking. 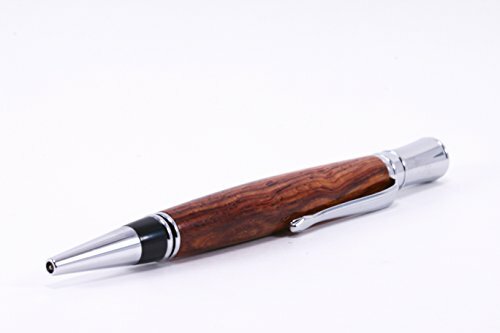 Model: Writer's Pen Pen Type: Ballpoint Ink Color: Black Wood: Cocobolo Rosewood Fixtures: Chrome, Black Acrylic Refillable? Yes Finish: Satin - The low gloss, satin option is perfect for anyone who wants a truly authentic looking and feeling wooden pen. Any natural imperfections in the wood are removed through sanding and filling, resulting in a smooth and comfortable grip, while preserving the integrity and aesthetic of minimally treated wood. NOTE: the grain pattern of your one-of-a-kind pen(s) may vary from those pictured above. If you have any questions about this product by Elder Pens, contact us by completing and submitting the form below. If you are looking for a specif part number, please include it with your message.